Blog - Food Freight Handling? For example, a major part of our business is serving food and grocery distribution customers.Food logistics is of course highly regulated, and we are tightly organized around food handling requirements. Both drivers and management know and apply the appropriate regulations especially concerning cleaning and temperature. And our trucks feature the latest in temperature control and load handling equipment. Typically our food customers will add additional contractual requirements of their own, requirements which go beyond government safety standards. Customerrequirements are also oriented to minimizing losses due to improper handling. So when our drivers head out on runs they are well prepared to complete the customer’s business. They’ve got the right training and experience, and the best trucks and equipment. And because we work at ensuring close communications with our customers, the driver will of course be completely informed about the load, route and terminal for the day’s work. But once we leave the yard, then it’s up to the driver! Even though our drivers are always in touch with our dispatch team(and the trucks are also monitored through GPS and telemetry), on the road the driver professional is the boss. It’s at that point that the individual driver’s experience and judgement come in to play. Especially in food, our customers see our driver team every or almost every day; that’s how reputations are made. And so it has been the strength of the PRO City Cartage driver team reputation that has been the key enabler for our growth. Our customers see good work, good work that is also consistently good. 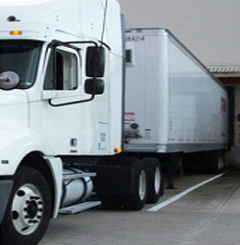 Uniquely in food and grocery, regular cartage shipments to the same locations occur day-in, day-out, mostly regardless of the weather. Shipments are very time-sensitive. And for these reasons, knowing the routes, and the terminals – and terminal staff, can make a big difference in completing a job successfully. We are fortunate at PRO City Cartage that as we have grown our driver team has been very stable. And it’s probably no accident that our customer retention is extremely high too – because when our knowledgeable drivers are on your route, you know that your delivery will be on-time and and well-treated. Whether in distribution channel or retail, the food business runs on slim margins. There’s no room for even minimal losses in transit. We all enjoy the marvellous selection of well-stocked grocery stores that are typical in Canada. Let’s give a thought for a moment to the professional drivers that are up early every day to make sure that selection is waiting for you when you visit your favourite retailer!